Choosing the flooring in your home is one of the most important decisions you’ll make as a homeowner. Although a variety of flooring options are available, carpeting and wood are two of the most popular choices. 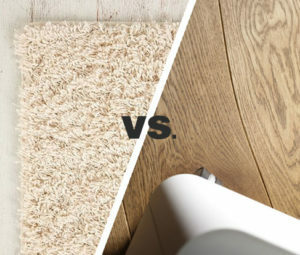 Comparing the pros and cons of these two flooring options will help you make the right selection for your home. Carpeting provides a number of benefits that homeowners everywhere will appreciate. First, carpet is available in a range of textures, colors, and fibers, meaning you’ll be able to choose carpeting that matches your exact tastes. Installing carpet is also much less expensive than other flooring materials. Due to its ability to absorb sound, carpet can help your home stay quieter, and carpet on your floors also feels very comfortable underfoot. Finally, carpet can be installed relatively easily. While beneficial in many areas, carpet also has some drawbacks that you should consider. The lifespan of this flooring material is shorter than other flooring options, and cleaning carpets can also be quite difficult. If your carpet is exposed to direct sunlight, its color can fade over time. Allergens and mold can also easily infiltrate carpet, potentially impacting your family’s health. Longevity is the biggest benefit of wood flooring. Wood floors are durable and can last decades with minimal need for maintenance. If your wood floors suffer damage, they can be refinished easily. Several species of wood can be used for wood flooring, and a range of styles and colors is available. You can also use most types of wood floors with a radiant heating system. Installing wood floors is much more difficult than other flooring types, which can be a concern for some homeowners. Additionally, material costs for wood are usually much higher than other types of flooring. If comfort is your main concern, wood flooring is usually a poor choice. Wood floors feel cool to the touch and are much harder underfoot. Unlike carpeting, wood floors do not provide any heat or sound insulation. Wood floors can also be easily damaged by exposure to sunlight and moisture. Opinion: Hardwood floors are the way to go! 90% of homebuyers ask me to see homes with hardwood floors. If there is carpet, they want to know if there is hardwood underneath. It’s cleaner, more presentable and preferred by most. Carpet does have its benefits; mainly the ‘comfort factor’ in bedrooms. If you plan to sell in the future though, you may want to make worthy investment choices. Pay the premium to give your home leverage over the competition.